Sophie Masson is an icon of Australian literature. I’m delighted she has spared time to chat to me about her sources of inspiration in celebration of the launch of her latest adult thriller set in Russia, Trinity: The False Prince, which is the sequel to Trinity: The Koldun Code, which are both published by Momentum Books. Sophie is the award-winning and internationally-published author of over 60 books for children, young adults and adults, published in Australia and many other countries. Her latest novels for young people are Hunter’s Moon (Random House Australia, 2015) The Crystal Heart (Random House Australia, Notable Book, CBCA Awards 2015), 1914 (Scholastic Australia 2014) and Emilio (Allen and Unwin 2014). Meanwhile, her non-fiction adult title, The Adaptable Author: Coping with Change in the Digital Age was published by Keesing Press in 2014. Sophie is also one of the founding partners and co-director of Christmas Press. She is also on the Board of the Australian Society of Authors and the Board of the New England Writers’ Centre. 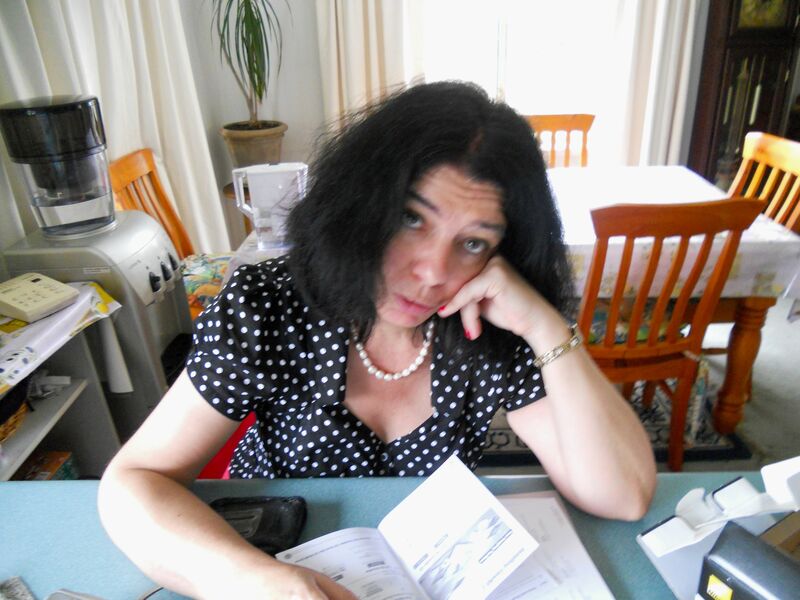 She has also served on the Literature Board of the Australia Council and the Book Industry Collaborative Council. In 2015, she has started a PHD in Creative Practice at the University of New England. You can learn more about Sophie and her books on her website and blog Firebird Feathers, and she would love to connect with you via Facebook and Twitter. I started writing—making up stories!— when I was so young I can’t remember exactly what made me first do so! But I think the fact I was read to a lot, and told stories to a lot, made me feel that telling them myself was very natural! I’m interested in many different periods of history and have written books set in the Middle Ages; in the Renaissance; the 18th and 19th centuries; the early 20th century, as well as WW1 and WW2; and our own time! I use both secondary resources (books about a period) and primary sources—books, magazines, newspapers from the time. I love second-hand bookshops, both in the ‘real’ and the virtual worlds, and have collected lots of wonderful original material. Agatha Christie, William Shakespeare, Herge (author/illustrator of the Tintin books), CS Lewis, Tove Jannsson, Sigrid Undset, Anya Seton, Nicholas Stuart Gray…the list goes on and on! Head for the dictionaries and thesauruses, both print and online! 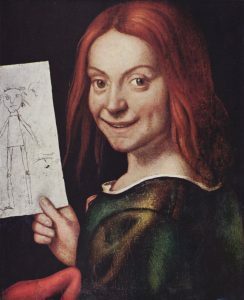 Well, I love art and there are lots and lots of pieces of art I love, but here is just one—this lovely lively painting by Francesco Caroto (1480-1555) of the artist’s young son, delighted at doing the same thing as his dad! Such a beautiful, intimate, homely and humble picture, it speaks down the ages to us—and it’s very unusual for the time in featuring a child in a non-formal pose. I first found this picture online some years ago and then a little later when we went to Verona, Italy, where the painting is held in the Castelvecchio Museum, I saw the original. A very touching moment! Always keep your eyes and ears open—inspiration can often come from a stray sight or overheard word. 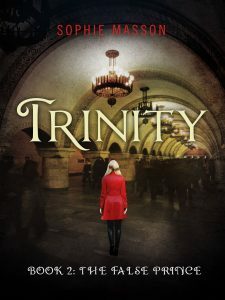 My new book, Trinity: The False Prince, is the sequel to Trinity: The Koldun Code, which came out last year. 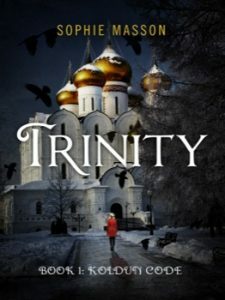 A gripping and unusual mix of spy thriller and the supernatural, it’s set in modern Russia, but a Russia completely imbued by its dramatic, fascinating and bloody history. Thanks Sophie for taking the time to tell us about your sources of inspiration! The False Prince is the second book in the Trinity series by Sophie Masson, which began with The Koldun Code. You can buy the Trinity: The False Prince at Momentum – and The Koldrun Code is currently free!